Electrochemical remediation methods require an ion-conducting medium to perform their function of oxidizing or reducing polluting species. For this reason, gaseous mixtures must be normally absorbed first in aqueous solutions to be treated. 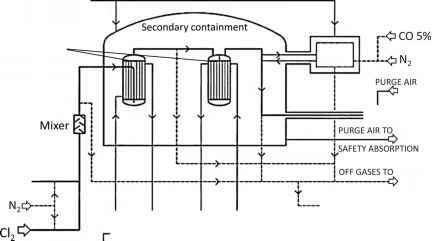 This can be accomplished either by using an absorption medium inside an electrochemical cell ( inner-cell process) or by first absorbing the gas and then transferring the absorption medium into the electrochemical cell for treatment (outer-cell process). Also, in such methods the polluting species can either undergo electron transfer on an electrode surface (direct electrolysis), or electrons can be shuttled to/from the electrode by an electron carrier or mediator (indirect electrolysis). Some examples of gases treated electrochemi-cally are discussed in Chapter 10. This presents the following disadvantages: 1) hydrogen is essentially wasted, because H2O is produced from it, 2) the high temperatures and catalysts required do not offer flexible adjustment to varying concentrations of H2S, 3) a pre-treatment for the separation of companion hydrocarbons and H2 is required, and 4) a post-treatment is required since the Claus process converts only 90-98% of the initial H2S content.